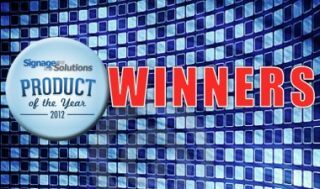 January 14, 2013 (DALLAS) – Signage Solutions, the technology and solutions magazine for digital signage, DOOH, mobile and place-based digital media, announced the winners of its 2012 Product of the Year Award today. The Signage Solutions Product of the Year Award recognizes the most innovative products of the year in the digital signage field. In its inaugural year, the award program is honoring the outstanding product development achievements of digital signage manufacturers whose products are considered exceptional in the advancement or development of the digital signage industry, as well as their ability to best serve end users and consumers. Winners will receive their awards and be recognized at Digital Signage Expo 2013 in Las Vegas, February 26-28. They will also be highlighted in the January/February 2013 issue of Signage Solutions magazine, as well as in special marketing and promotion materials and on the magazine's website, www.signagesolutionsmag.com. Information on the 2013 Product of the Year Award will be available at www.signagesolutionsmag.com in the summer of 2013. Signage Solutions magazine and its web site are the technology and solution resource for digital signage, digital out-of-home (DOOH), mobile and place-based digital networks. Signage Solutions magazine (published bi-monthly) and its website are devoted 100% to digital signage, digital out-of-home and place based networks. Editorial content addresses the needs and concerns of the end user, integrator and network operator. Signage Solutions explores digital signage solutions and products and how they can be applied to better serve our readers within their industry profession. Signage Solutions magazine reaches over 18,000 readers within all industries adopting digital signage. Learn more at www.signagesolutionsmag.com.